Chicken and Sundried Tomato Pasta! You are here: Home / Recipes / Dinner / Chicken and Sundried Tomato Pasta! 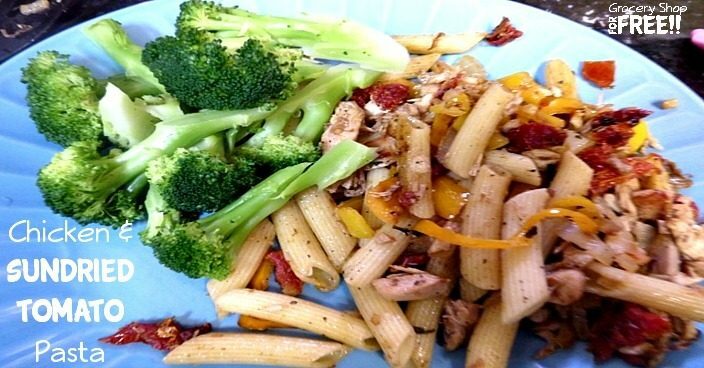 Susan is back with another fun recipe: Chicken and Sundried Tomato Pasta! I am always looking for something to do with leftover chicken. One of my favorite things to eat is a roasted chicken and I cook one almost weekly….or buy one already cooked. I like chicken breast and my husband likes dark meat and wings….and we have an empty nest. So, we eat a half a roasted chicken for the first meal and then we have half a chicken leftover dish the next night. So, this recipe is normally made with that second half of chicken, however, I decided to try it this week with some leftover smoked chicken and it added a nice little flavor. I made it for 2 people…maybe 3 smaller portions so, add more as needed. This is a very simple to make recipe and it is heart healthy if you use the right pasta. Plus, you will have a very flavorful and hearty meal. I just pour some olive oil in the pan but it is probably about 2 tablespoons. If that is not enough, you can always add more. Sauté the bell pepper and onion until tender. Add the garlic and tomatoes and sauté for a few more minutes. The garlic doesn’t take long and the tomatoes really only need to be heated for a few minutes. Add the chicken and heat through and add water to loosen all the bits from the skillet. Add the cooked pasta (cooked according to back of the box) until pasta is heated thoroughly. Serve this pasta with a nice green vegetable or a salad. You can top it with Parmesan cheese, to add a nice touch. My pasta was already cooked and frozen. Last time I made pasta, I cooked twice as much as I needed and put the rest in the freezer. I always keep sliced onion in the refrigerator so that it is easy to grab some and add it to any dish. This is a hassle when I first cut it but I am always so happy as the week progresses. I buy a large jar of sundried tomatoes from Costco and keep it in the refrigerator. It is good on homemade pizza and bruschetta. It is also good in Lasagna. I buy the small little colorful bell peppers from Costco or Sams too. They are a little bigger than jalapeños. These are much cheaper and they stay fresh longer than cutting into a bell pepper and only using part of it. I use them in salads and many other recipes. If you don’t buy olive oil, you can use any vegetable oil. However, olive oil will help to lower bad cholesterol and raise good cholesterol….so, it is really heart healthy. Use any leftover chicken, except fried…boiled, baked, pan seared, smoked. Or cook a couple of chicken breasts just for this dish. Hi, my name is Susan and Permanent Posies (Creative Chaos) is the name of my blog and my subject matter is…well, that depends on the day and the mood. But, for the most part, I love cooking, watching the Food Network, reading cookbooks and, of course, eating. I am also an artist and spend time each week in my studio (bedroom) oil painting. I am a mother of four and a grandmother to 5 and that, along with my husband and 2 dogs, take up my most of my time. I am a side-tracked Home Executive and I had the privilege of being a stay –at-home mom so, you might say that my passion is the home and making a haven for those I love.